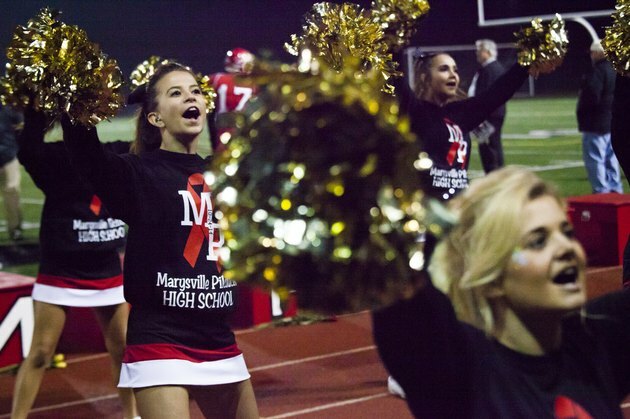 Even as a beginning cheerleader, your cheer library should include many types of cheers. You need chants for when your team is on offense -- "2, 2, we want 2!" -- and on defense -- "Steal that ball!" You also need all-purpose chants like, "Go! Fight! Win!" Chants typically are repeated three or more times. Crowd-involvement cheers are those that have a special part the crowd is supposed to cheer back to you. For example, you cheer: "We say Go, you say Fight -- Go!" and the crowd should yell back, "Fight!" Finally, you need longer cheers that can be performed out on the floor during halftime or between quarters. These cheers are typically only repeated once. Start with Clasps for "S, C, O." Quickly add "R" in between Clasps, and then Clasp again on "E." Hit a Low V motion on "Score." Come back to a Clasp on "Team." You can substitute the name of your team's mascot here instead of "Team." End the cheer with a High V on the "Score!" Since this is a chant, come back down to a Clasp, saying nothing. Then repeat the chant two more times.